Rochester, New York. 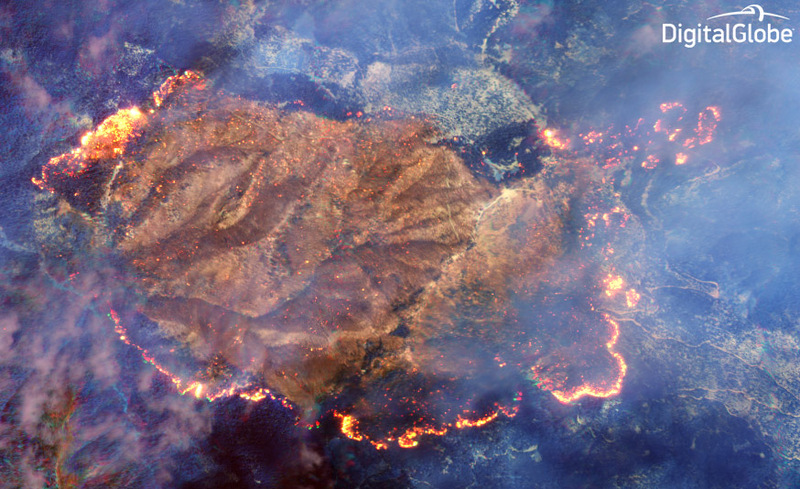 September 24, 2014 – The Exelis-built shortwave infrared imager (SWIR) on DigitalGlobe’s WorldView-3 satellite cut through a thick cloud of smoke to capture images of an active forest fire, marking the first time this capability has been commercially available from a satellite platform. Taken above the Happy Camp complex in California’s Klamath National Forest, the images show an active fire beneath a thick cloud of smoke. Hot spots are clearly visible even without being shown at full resolution. Exelis built the integrated, super-spectral imaging system, which includes a telescope, sensor and SWIR system, for the WorldView-3 satellite. The advanced imaging system is the first of its kind on a high-resolution commercial imaging satellite and allows DigitalGlobe to offer imagery that cuts through haze, fog, smog, dust, smoke, mist and cirrus clouds, and allows clearer identification of materials not visible to the human eye. The SWIR bands penetrate smoke to differing degrees, which will allow firefighters to see through the smoke to the ground below, as well as locating the flame front and hot spots in the fire. Using heat maps generated by WorldView-3 will allow firefighters and emergency responders to save lives and resources, while increasing their personal safety. WorldView-3 launched on a ULA Atlas V rocket in August from Vandenberg Air Force Base in California and is now in orbit 617 kilometers above Earth. In addition to firefighting, WorldView-3 will help with accurate crop mapping; efficient site selection, exploration and environmental monitoring for the energy industry; and mineral identification and chemical measurements to support mining, as well as a variety of other applications. To read more about SWIR technology and to see a variety of images, visit DigitalGlobe’s blog.